Mayor Brian Bowman is committed to building a City Hall that works through openness and transparency. A growing, thriving, more modern city that we are all proud to call home, and a city that receives its fair share through a funding model that works as we grow towards one million people strong. Mandate letters provide direction on key responsibilities and outline expectations of those serving as Chairperson for each of Council’s six standing policy committees. They also provide direction to those serving as Deputy Mayor, Acting Deputy Mayor, and Chairperson for the Winnipeg Police Board. Serving as a member of Executive Policy Committee requires strong leadership that transcends ward boundaries in the interest of building a stronger Winnipeg overall. This is the first time mandate letters have been provided to Executive Policy Committee members and also made publicly available in an open and transparent manner. Mayor Bowman is dedicated to restoring public trust in government. This is accomplished through initiatives that increase and improve engagement with Winnipeggers, provide greater access to important information for citizens and elected members of Council, and partners with both levels of government. Working collaboratively with the City Clerks department, establishing an office expenditure policy for the Mayor’s Office. Amendment to the Elected Officials Compensation By-law that reduces the salaries of the Mayor, members of EPC, the Council Speaker, and Deputy Speaker, returning $400,000 to City revenues. Granting public access to the Mayor’s schedule of monthly meetings hosted in the Office of the Mayor – the first Winnipeg Mayor to provide this level of access. Proactive disclosure of previously unreleased information such as the external comprehensive assessment of City of Winnipeg’s water system as it relates to recent boil water advisories report. Establishment of the new Office of Public Engagement that directs public consultation activities of major City projects, with the improved engagement expectations of the community. Establishment of the Whistleblower Protection Act for civic employees with the support of the province – the first municipality in Canada to enact this protection legislation. Livestreaming of EPC and City Council meetings. Livestreaming of Mayor’s media scrums (interviews) at City Hall. Dedicating $103.3M – record levels of funding – to key priorities like street renewal, while keeping tax increases as low as possible. Endorsing the United Way’s 'Plan to End Homelessness', committing $750,000 to the plan by 2019. Funding the development of the City’s first ever Transportation Management Centre to manage traffic flow, to be operational by the end of 2016. Decreasing the City’s business tax rate from 5.7 to 5.6 percent, providing nearly half of all Winnipeg businesses (annual rental value <$30,000) with a full rebate. Developing a sustainable, multi-year funding plan to ensure completion of Stage 2 of the Southwest Rapid Transitway remains on track. This includes partnering with the federal government to secure P3 funding and approving a financing solution by front-ending a portion of the province’s financial commitment. Establishing the $1 million Innovation Capital Fund to provide investment for the best ideas for improved efficiency, service delivery, and responsiveness in City operations. Creating a small business summit in partnership with the Winnipeg Chamber of Commerce, to allow Winnipeg to hear from local small businesses regarding policy and initiatives that will help them grow and thrive. Establishing the BuildWINNIPEG partnership task force – the starting point for a 10-year plan to repair and build roads, public transit, and active transportation networks, to be chaired by former City of Winnipeg CAO and President and CEO of CancerCare Manitoba Foundation, Annitta Stenning. Approving the sale of City-owned industrial land to Parmalat Canada Inc. for the expansion of a new fluid milk processing plant in Winnipeg. Adopting the City’s 20-year long-term Pedestrian and Cycling Strategies providing City Council with a guideline for future active transportation budgets, consultations, and planning. 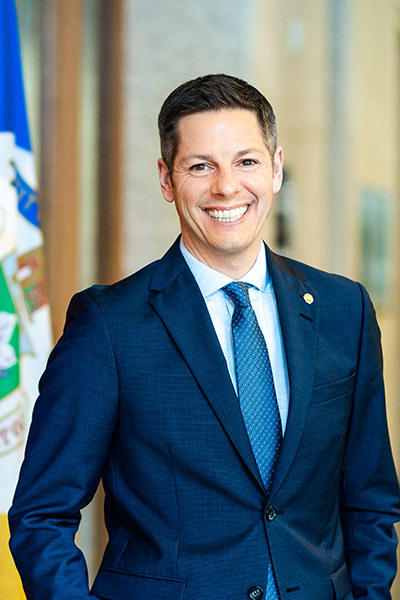 Mayor Brian Bowman believes Winnipeggers deserve to celebrate our city and all our people. Creation of the Mayor’s Indigenous Advisory Circle (MIAC) to help increase awareness of important Indigenous issues in our community and address issues impacting Indigenous relations city-wide. Creation of the national summit against racism in partnership with the Canadian Museum for Human Rights. Increased funding for the arts, and more museums to move us closer to the national per capita average. Flag Raising celebrations at City Hall to recognize our cultural community, important events,and organizations. Flag raising of our 13 flags at Portage and Main to recognize and support significant achievements by Winnipeg’s professional sporting teams, celebrate important local events occurring in Winnipeg, and recognize important accomplishments and milestones of local, national, and international organizations. Recognition of Winnipeg’s creative innovation and technology sector with Honourary Winnipeg Innovation Alley. Presentation of awards in recognition of the accomplishments of, and contributions by, Winnipeggers. Raise the need for the new funding model discussions to occur amongst the Mayors and leaders at FCM (Federation of Canadian Municipalities) encouraging municipalities to engage the federal government in the discussion to make this issue a federal priority along with infrastructure, housing, and public transit. Lead continued discussions with the Premier to work collaboratively on a new funding model solution.